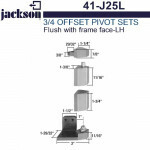 CRL/Jackson® 41-J25L Left Hand 3/4" Offset Pivot Hinge Set- Flush With Frame Face. 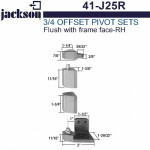 CRL/Jackson® ..
CRL/Jackson® 41-J25R Right Hand 3/4" Offset Pivot Hinge Set- Flush With Frame Face. 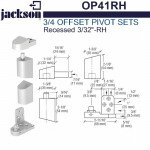 CRL/Jackson®..
CRL/Jackson® 41-J26L Offset Left Hand Pivot Set with 1/8" Recess. 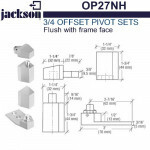 CRL/Jackson® Offset Pivot Sets..
CRL/Jackson® OP27NH Offset Reversible Pivot Set Flush With Frame Face. CRL/Jackson® Offset Pivot..
OP28NH Jackson 3/4" Offset Pivot Set - Recessed 1/8"
CRL/Jackson® OP28NH Offset Reversible Pivot Set With 1/8" Recess. 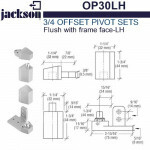 CRL/Jackson® Offset Pivot Sets..
CRL/Jackson® OP30LH Offset Left Hand Pivot Set Flush With Frame Face. 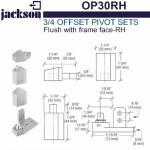 CRL/Jackson® Offset Pivot ..
CRL/Jackson® OP30RH Offset Right Hand Pivot Set Flush With Frame Face. 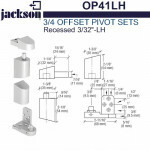 CRL/Jackson® Offset Pivot..
CRL/Jackson® OP40LH Offset Left Hand Pivot Set With 1/8" Recess. 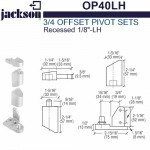 CRL/Jackson® Offset Pivot Sets ..
CRL/Jackson® OP40RH Offset Right Hand Pivot Set With 1/8" Recess. 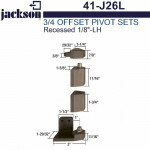 CRL/Jackson® Offset Pivot Sets..
CRL/Jackson® OP41LH Offset Left Hand Pivot Set With 3/32" Recess. CRL/Jackson® Offset Pivot Sets..
CRL/Jackson® OP41RH Offset Right Hand Pivot Set With 3/32" Recess. 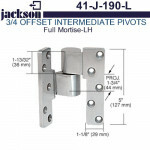 CRL/Jackson® Offset Pivot Set..
CRL/Jackson® 41-J-190-L 3/4" Offset Intermediate Left Hand Pivot. 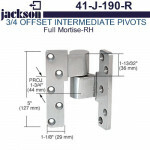 The Jackson® J190 Intermediate..
CRL/Jackson® 41-J-190-R 3/4" Offset Intermediate Right Hand Pivot. The Jackson® J190 Intermediat..